Puerto Vallarta, Jalisco, Mexico - Many good parties are the result of a wedding, and Oktoberfest is no different. It all began on October 12, 1810 with the Royal Wedding of King Ludwig I and Princess Therese of Saxony-Hildburghausen. To commemorate their marriage, the prince and princess organized a great horse race and other festivities around that event. The decision to repeat the horse races in the subsequent year gave rise to the tradition of the Oktoberfest. 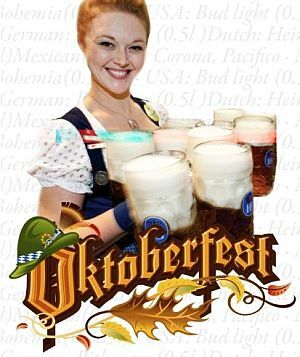 Today, Oktoberfest is the largest festival in the world, with an international flavor characteristic of the 21st century. Around 6 million visitors from all around the world converge on Munich for Oktoberfest every year and food is a big part of the party. Here in Puerto Vallarta, you can enjoy authentic German food and spirits - without the crowds - at Kaiser Maximilian. The chefs have created a special menu featuring authentic German food that they're serving up in addition to the restaurant's traditional Austrian fare through November 10, 2018. In Germany, special beers are brewed just for the festival so, in addition to Mexican and American selections, Kaiser Maximilian is offering German beers, including HB Hofbräuhaus original, HB Dunkel oscura and Erdinger Weissbier, along with Cervezeria Steinbock, which is made in Mexico with German experience, and a fine selection of German wines to complement the Oktoberfest menu. Come out and celebrate Oktoberfest at Kaiser Maximilian through November 10, 2018. Whether dining al fresco at the European-style sidewalk café tables, or in the intimate air-conditioned dining room, you'll enjoy the fabulous cuisine, professional service and elegant atmosphere that have made Kaiser Maximilian a top spot for fine dining in Puerto Vallarta. Click HERE to read more about Kaiser Maximilian.